Preheat the broiler to 180°C (350°F/Gas 4). Line a preparing plate with heating material. Barrage the cauliflower in a nourishment processor until it takes after breadcrumbs. Put the cauliflower in a microwave-evidence dish and microwave on high for 5 minutes or until relaxed. Lay out a spotless tea towel, and once the cauliflower is sufficiently cool to deal with, tip it onto the towel, wrap the sides up, and press out as much dampness as you can. This will prevent the pizza from getting to be distinctly spongy. In a bowl, consolidate the cooked cauliflower, egg, almonds and Parmesan. Blend well, then tip onto the plate and utilize your hands or a spoon to spread the cauliflower base into two circles, 25 cm (9 in) each. Make the edges marginally thicker to make an outside. Heat in the broiler for 10–15 minutes or until brilliant cocoa. Put aside to cool. Increment the broiler temperature to 200°C (400°F/Gas 6). 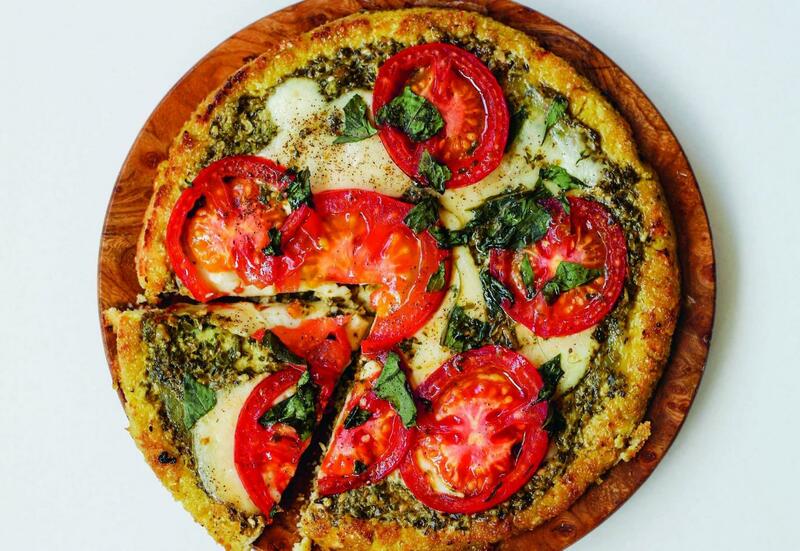 Spread the pesto over the pizza base, then organize the mozzarella and tomato cuts on top. Prepare in the broiler for 10 minutes or until the mozzarella has softened. Once cooked, put aside to cool. Put the pizzas into 2 substantial lunch boxes (cut the pizzas into cuts if need be), and store in the ice chest overnight. To serve, warm the pizza in the microwave until warmed, and sprinkle over basil to decorate.